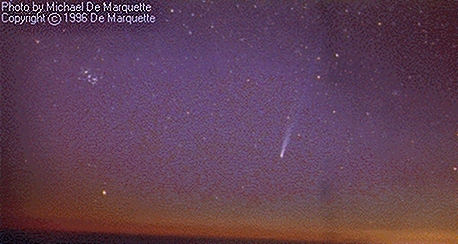 The first image is a picture of Comet Hyakutake taken by Michael DeMarquette accompanied by Gregg Thompson of Culver City, CA. Was taken at the summit of Mt. Pino's,CA. elevation 8,830 ft. on april 20, 1996 at 8:30pm PST. It was taken with a Minolta X-700, 50mm lens @ F/2.0, time for exposure was 1min, film used was Kodak Royal Gold 1000 asa. Tracking device was a homemade straight bolt equatorial mount on tripod, (now automated) . The second image is a picture of Comet Hyakutake (same information as above accept) 28mm lens @ F/3.5, time for exposure was 4min 15sec, taken at 8:48pm PST ( the moon,venus,and mercury are all visible) The third image is a picture of Comet Hyakutake (same information as at top accept) 50mm lens @ F/2.0, time for exposure was 1min 30sec, taken at 9:15pm PST. My thanks to Ron Baalke,and to Richie Kelch for the use of his scanner. 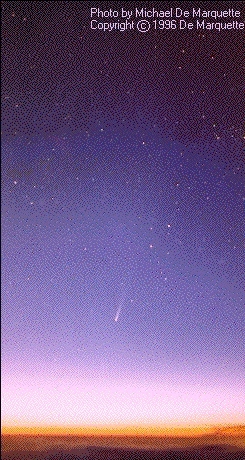 Goodbye Comet 1996/B2 (HYAKUTAKE) You were quite spectacular!!! 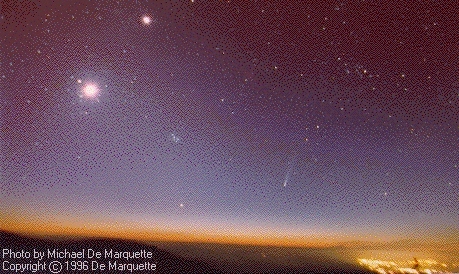 See you Soon Comet Hale-Bopp!! !